So you upgraded to Snow Leopard? I did the day it came out, and it is a great release. So far I have found it very stable and it didn’t take long for the updates to the applications I use to flow in. In fact, many vendors had beta versions ahead of the release which made the transition easier. One thing you might have discovered if you are a user of Quicktime Pro, is that things are not quite the way they used to be. The new Quicktime in Snow Leopard is completely new from the ground up. So things you might be used to, like an export feature, are missing in action. If you are shaking your fists angrily in the general direction of Cupertino, fret not. Apple has included a copy of Quicktime 7 in your utilities (applications/utilities) folder automatically if you previously had Quicktime Pro installed. Don’t have it installed yet? Well then follow the instructions here. Indeed. What was Apple thinking?? I pondered this initially but when you dig a bit deeper the reasoning becomes clear(er). Quicktime X is something very different. It is no longer a aging legacy media tool with roots from way back in 1991. This is something coded from the ground up to sing in OSX. John Siracusa covers its difficiencies quite well in his article on arstechnica.com. See here and here for coverage of Quicktime 7 and Quicktime X. Unfortunately, the list of things you can’t do with the new QuickTime Player is quite long. You can’t cut, copy, and paste arbitrary portions of a movie (trimming only affects the ends); you can’t extract or delete individual tracks or overlay one track onto another (optionally scaling to fit); you can’t export a movie by choosing from the full set of available QuickTime audio and video codecs. All of these things were possible with the old QuickTime Player—if, that is, you paid the $30 for a QuickTime Pro license. In the past, I’ve described this extra fee as “criminally stupid”, but the features it enabled in QuickTime Player were really useful. But if you can get past these limitations (and use Quicktime 7 for your video editing/transcoding) there are some good things to like in Quicktime X. For example you can now record your screen or upload videos directly to YouTube and MobileMe, email them or even import them into iTunes. In the end Quicktime X represents a big step forward for media playback in OSX. Like it or not, it’s here to stay. Thankfully, so is Quicktime 7. I highly recommend reading John’s article through. 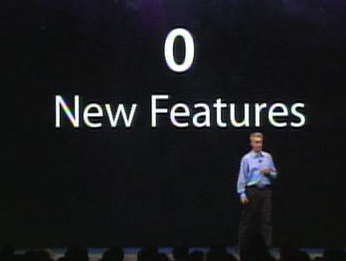 It will shed some light on that $29 upgrade why it included exactly “0 new features”.